TAIPEI, Taiwan—In an event that highlighted the differences between China and its cross-strait democratic neighbor Taiwan, the United States and several Asian countries organized a public forum that discussed Beijing’s persecution of religious groups. The two-day event, titled “A Civil Society Dialogue on Securing Religious Freedom in the Indo-Pacific Region,” kicked off March 11 in Taipei, and was attended by about 70 religious representatives from 15 countries. 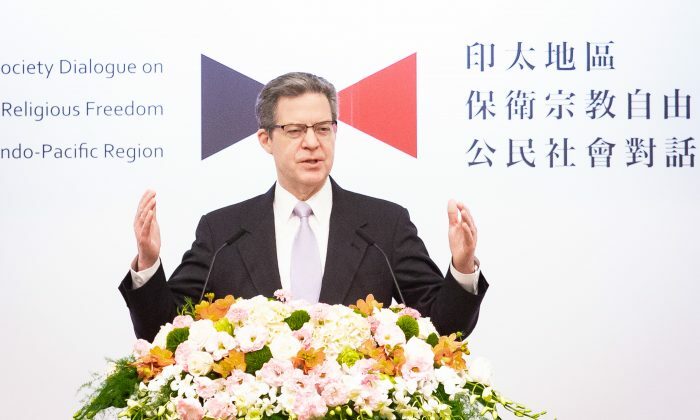 Among the speakers at the opening ceremony were Taiwanese President Tsai Ing-wen; William Brent Christensen, director of the American Institute in Taiwan (AIT), the de facto U.S. Embassy in Taiwan; and Sam Brownback, U.S. ambassador for international religious freedom. Brownback began by discussing China’s arbitrary detention of more than 1 million Uighurs, ethnic Kazakhs, and other members of minority Muslim groups since April 2017. He added examples of Tibetan Buddhists and house church members who aren’t allowed to worship freely. Tibetans are not allowed to venerate the Dalai Lama and house churches have been routinely destroyed. Brownback also discussed the plight of Falun Gong practitioners, who are detained and tortured for their faith. Falun Gong, also known as Falun Dafa, is a spiritual discipline that grew popular in China in the early 1990s, as the number of adherents embracing its moral teachings and meditative exercises exceeded 100 million, according to official estimates. The discipline’s popularity was quickly viewed by then-Chinese Communist Party leader Jiang Zemin as a threat to his rule. In July 1999, Jiang launched a nationwide persecution of the group, throwing hundreds of thousands into prisons, labor camps, and brainwashing centers. According to Minghui.org, a U.S.-based website that tracks the persecution of Falun Gong in China, thousands have been killed while being detained in China. On the contrary in Taiwan, the discipline has steadily flourished and become popular among many Taiwanese. “Like you can do here in Taiwan, [religious freedom] should be the norm for everybody throughout the region and the world,” Brownback said in his speech. Brownback’s remark was echoed by Christensen, director of the AIT. Tsai, in her speech at the opening ceremony, stated that Taiwan has decided to “stand with the people who are deprived of their religious rights or oppressed by authoritarian regimes” because the island state knows the pain of having one’s rights and identity deprived. She added that Taiwan is committed to building a world free of fear and persecution due to religious or ethnic differences. At a press conference held after the opening ceremony, Brownback was asked by a reporter whether the U.S. government would take any action in the near future to stop the persecution of Falun Gong in China, and about the possibility of using the Global Magnitsky Act to target Chinese officials with ties to religious persecution. Passed into law in 2016, the act allows for sanctions against individuals who commit human rights violations, including freezing their U.S. assets and barring them from entry into the United States.